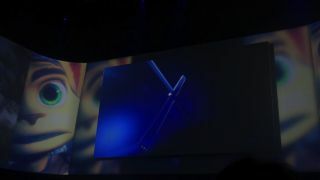 Sony bullishly announced the PS4 in New York this week, before Microsoft had a chance to unveil the Xbox 720. But behind the company's glitzy PS4 game demos and the DualShock 4 controller are some causes for concern, said one analyst at the event. "It's a different industry now," said Inside Network senior analyst Billy Pidgeon. "People are buying fewer games discs and more downloadable content, including $.99 titles." "It really changes the business. What's going to sell PS4 is if it's priced properly and if there are games within the first six months that people can count on. Then it'll do well out of the gate." That being said, Pidgeon cautioned that doing well enough out of the gate doesn't mean that Sony has a long-term success on its hands - just ask Nintendo about its original Wii sales. "Next year  will be important," he speculated. "I think that'll be the same for both [Sony's PS4 and Microsoft's Xbox 720] consoles." Sony laid out a number of reasons why its new console will be worth buying: Gaikai-powered remote play, Diablo 3, and launch titles from its top developers. But there are just as many reasons PS4 could fail, according to the analyst. "It's just the way the economy is, and we've had a extenuated seventh generation, so uptick is going to be slower than people expect." "It'll be really important to get a broad and deep library of games for this generation even more than the last one." "It's all going to come down to the games, but I think both consoles are going to do less well than expectations. I think expectations are going to be higher for this next generation." He also said that one thing that might be tricky for Sony - and for Microsoft as well - is keeping the current console generation viable while rolling out the next-generation. "If the PS3 falls off too rapidly, Sony would lose a lot of market share," warns Pidgeon. Another potential distraction for consumers who will be deciding whether or not to purchase Sony's PS4 is the presence of new major players in the living room. Apple and Google have been rumored to be inching their way into the video game market for a while, and Valve is launching its first hardware entry with the Steambox. "Apple will come out with something," Pidgeon predicted. "But it's looking like it's going to be all-in-one television, which is going to be prohibitively expensive to establish a decent base." "If the Apple TV is a $13,000 TV, it's going to take them a while to have a decent platform there." The analyst also felt that Apple doesn't have a feel for games like Sony and Microsoft do, and it instead treats games like a commodity. Instead, Google and Valve may have more of an impact on Sony, while Apple remains a limited distraction. "Google really has a chance to execute, and so does Steam. I'm keeping an eye on Steambox." Though confident that this upcoming console generation won't be as easy as a quick time event in an "E for Everyone" video game, Pidgeon still wants to see more of what Sony has offer. "There are a lot of details missing: price, format factor, and physical media," he said. "The lack of backwards compatibility is understandable as it's completely different architecture, but Sony did give us a hedge that Gaikai could provide that later." "Only, it remains to be seen how much that would cost, as streaming would remain expensive. Peer-to-peer could work, however." While predicting that the industry will remain tough for Sony in its attempt to increase or even maintain its sales with PS4, Pidgeon did give props to the company on improving its press conferences. "Generally, Sony often tries to say too much and has a disorganized, disjointed presentation and loses some clarity of message." "This time it was much more professional and they did have a clear message here. They'll just need to build on it at GDC and E3, and that's really the way to do it."